Role for caspase-1–dependent inflammatory mediators other than IL-1β and IL-18 in Nlrp3-mutant mice. Nlrp3L351P Il1b–/– Il18–/– mice had (A) elevated WBC numbers (each data point represents an individual mouse) and (B) splenomegaly, as evidenced by spleen weight/body weight ratios compared with Nlrp3L351P Casp1–/– mice (n = 5 mice/group). 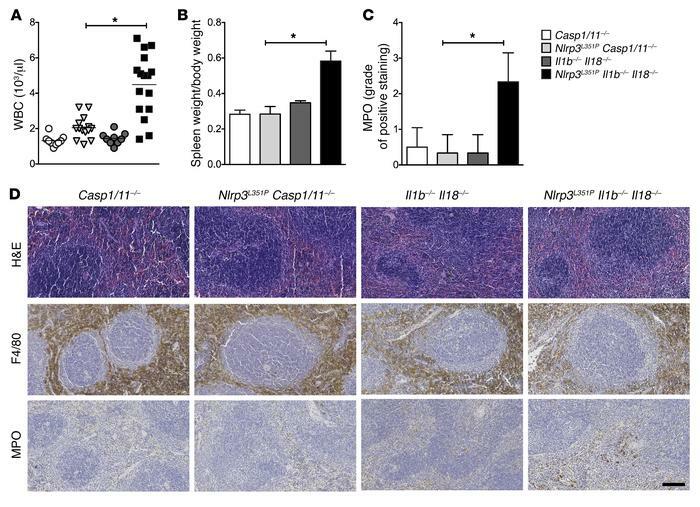 (C and D) IHC of splenic tissue showed increased MPO staining in Nlrp3L351P Il1b–/– Il18–/– mice and a similar degree of F4/80 staining in all groups. Images are representative of 6 mice per group (original magnification, ×20). Scale bar: 100 μm. *P < 0.05, by Kruskal-Wallis with Dunn’s multiple comparisons test, with the following comparisons: Casp1/11–/– versus Nlrp3A350V Il1b–/– Il18–/– mice; Nlrp3A350V Casp1/11–/– versus Nlrp3A350V Il1b–/– Il18–/– mice; and Il1b–/– Il18–/– versus Nlrp3A350V Il1b–/– Il18–/– mice. Data represent the mean ± SEM.